First, I narrowed down to a list of mentor texts. Because our final essay of the year is an inquiry essay that asks students to synthesize the research they’ve done on a topic of their choice, I chose mentor texts that integrated various perspectives, embedded evidence and research, and showcased various modes of writing, such as narrative, compare/contrast, definition, description, and so on. And because we’ve been focusing specifically on writing arguments in preparation for the free response questions on the AP exam, I also wanted mentor texts that were strong examples of coherent, logically organized, and well-supported arguments. Finally, I wanted to make sure that I had a variety of topics to capture student interest, revisiting many essays that were student favorites from years past. I passed out the essays, a few at each table, and had students browse and choose. I asked students to begin reading, and after about ten minutes or so, I asked them share a little bit of what they’d read so far with their group members. At this point, I gave students an opportunity to trade essays with anyone if they were more interested in another topic. Students then went home to read the rest of the essay. In class the next day, students found their classmates who had the same essay that they did (I ended up with 6 groups of four students and 1 group of five). After a few minutes of notebook time in which students did some free-writing about the essay, I gave students a few more minutes to discuss their personal responses to the text. My students have become fairly adept at discussion through the regular Socratic Seminar discussions we’ve done throughout the year, and I’ve found that allowing this initial period of open discussion allows ideas to emerge that might not otherwise with teacher-generated questions. Students practice the skills of summary and thesis identification. 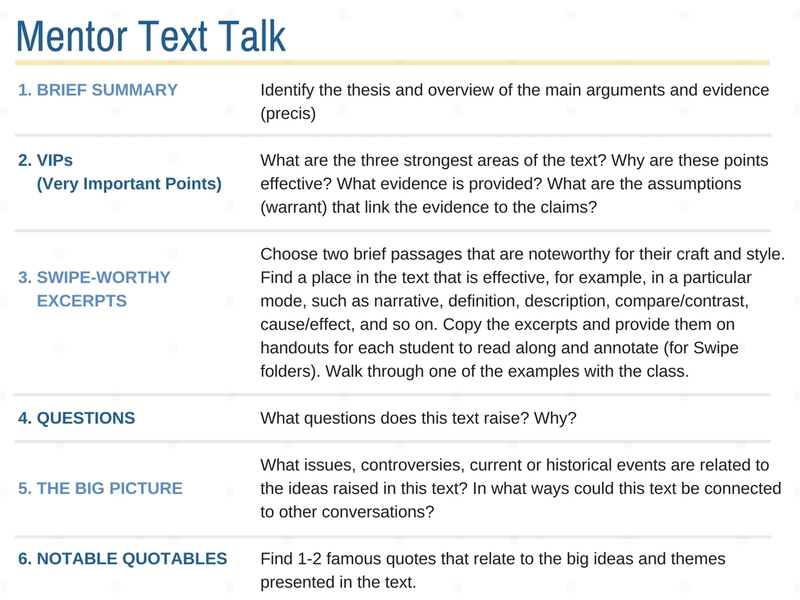 Here, students need to determine the most effective moments in the text, connecting claims and evidence. For this task, students zoom in one two excerpts that are worthy of close study of craft. I ask students to make copies for the rest of the class so that their peers can add these mini-models of specific craft moves to their Swipe Folders (see more about Swipe Folders in my earlier post). The argument prompt on the AP exam often asks students to consider the claims made in brief excerpts of longer texts or quotes from historical and contemporary thinkers. Here, I hope that students can identify a universal theme reflected in the mentor text and then find either complimentary or contrasting ideas in the words of others. And of course, I model what all of this looks like for students by presenting a “mentor text talk” for an essay that students had recently read, “The Future Needs Us,” by Rebecca Solnit. 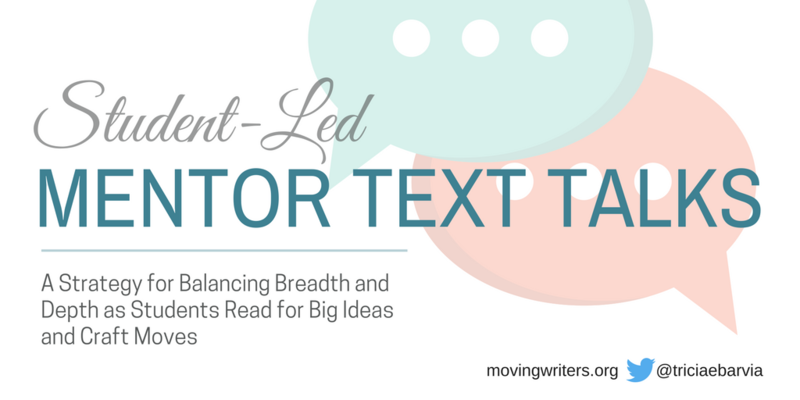 After students take 2-3 days to work on their mentor text talk, dividing tasks as needed, they then present their mentor text talks to the rest of the class. Each talk takes about 10-12 minutes. After each talk, I use a simple Google form to ask the students in the audience to reflect briefly on their wonderings, questions, and interest in the topic after listening. After students hear about each other’s essays, they then choose an additional 2-3 essays to read more deeply. By learning about seven different mentor texts, my hope is that students are able to get a broad sense of variety of issues and controversies that might help them on the AP exam free response questions. 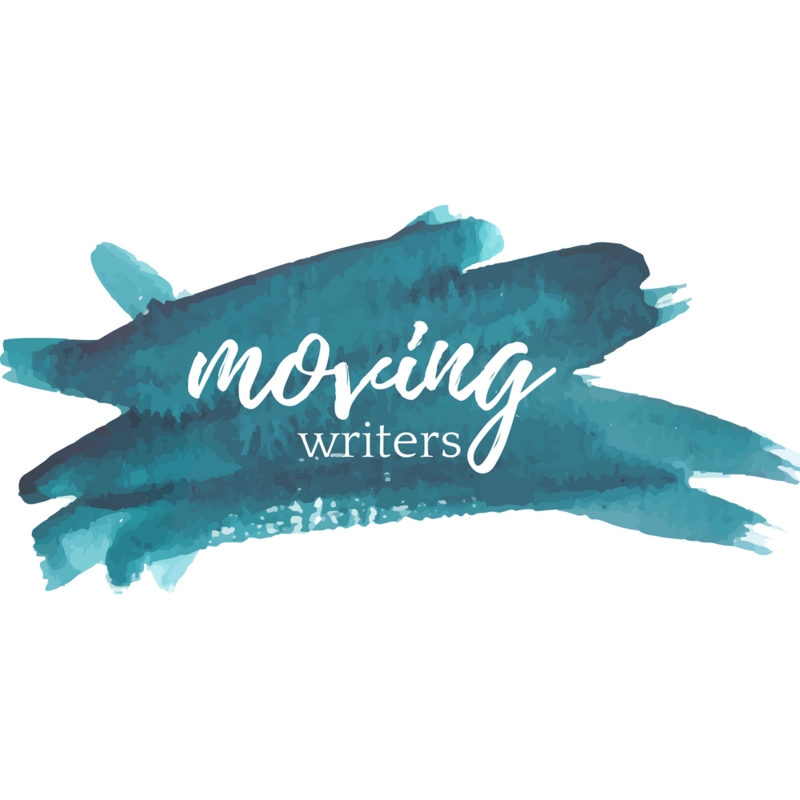 And by reading three essays more deeply, and by analyzing the craft of brief excerpts from all the essays, students will have mentor texts that they can revisit when they begin working on their inquiry essays after the exam. In this way, students will have worked on all three of the skills that they’ll need during and after the exam—rhetorical analysis, argument, and synthesis. So that’s it! Of course, there are endless variations on this task, and I’m sure when I do this again next year, it will look a little different, depending on where we are and what my students need in the moment. But I’ve found that this process helps to strike the balance of breadth and depth—and more importantly, puts the ownership of uncovering and constructing meaning where it belongs: in students’ hands.